Professor Dr. Anton Caragea, The President of global tourism institutions: EUROPEAN COUNCIL ON TOURISM AND TRADE and EUROPEAN TOURISM ACADEMY has designated the 2015-2030 period as the DECADES OF TOURISM FOR DEVELOPMENT. This decision of the world tourism and development institutions is a unique opportunity to raise awareness of the contribution of sustainable tourism to development among public and private sector decision-makers and the public, while mobilizing all stakeholders to work together in making tourism a catalyst for positive change. Presidential decision must be read out in the context of the universal 2030 Agenda for Sustainable Development and the Sustainable Development Goals (SDGs), and the DECADES OF TOURISM FOR DEVELOPMENT programme aims to support a change in policies, business practices and consumer behavior towards a more sustainable tourism sector that can contribute to the SDGs. The European Tourism Academy (ETA), the European Council on Tourism and Trade Agency, has been mandated to facilitate the organization and implementation of the DECADES OF TOURISM FOR DEVELOPMENT PROGRAMME, in collaboration with governments, relevant organizations of the European Council on Tourism and Trade system, international and regional organizations and other relevant stakeholders by appointing global leaders to be responsible for the programme completion and sustainble world development. These leaders of world community are to be recognized and appointed as GLOBAL AMBASSADORS FOR TOURISM AND DEVELOPMENT GOALS and are representing humanity best hope for a peaceful and inclusve and harmonius society. During the 70th Session of the UN General Assembly 154 heads of state or government adopted the bold and ambitious 2030 Agenda for Sustainable Development, along with the 17 Sustainable Development Goals (SDGs) that aim to, inter alia, - end poverty, protect the planet, and ensure prosperity for all. Based on his universal, integrated and transformative vision, European Council on Tourism and Trade is placing its efforts and tireless work in contributing with its technical assistance and capacity-building to the achievement of these global goals. European Council on Tourism and Trade is working with governments, public and private partners, development banks, international and regional finance institutions, the european agencies and international organizations to help achieve the SDGs. European Council on Tourism and Trade and European Tourism Academy and The Parliamentary Assembly for Sustainable Development Ggoals developed the ‘Tourism for SDGs platform’(http://world-tourism.website2.me/european-council-for-tourism-and-trade )- which is aimed at policy makers, international organizations, academia, donors, companies and all tourism stakeholders and encourages them to engage in SDG implementation strategies. The platform’s three main features, Learn, Educate and Communicate, are also calls for action, conversation and collaboration towards a sustainable tourism sector. Promoting peace and development across the globe! On December 9, 2017 in the presence of over 3,000 guests, diplomats, tourism and culture experts, the official ceremony for the new GLOBAL AMBASSADOR FOR TOURISM AND SUSTAINABLE DEVELOPMENT GOALS has taken place. 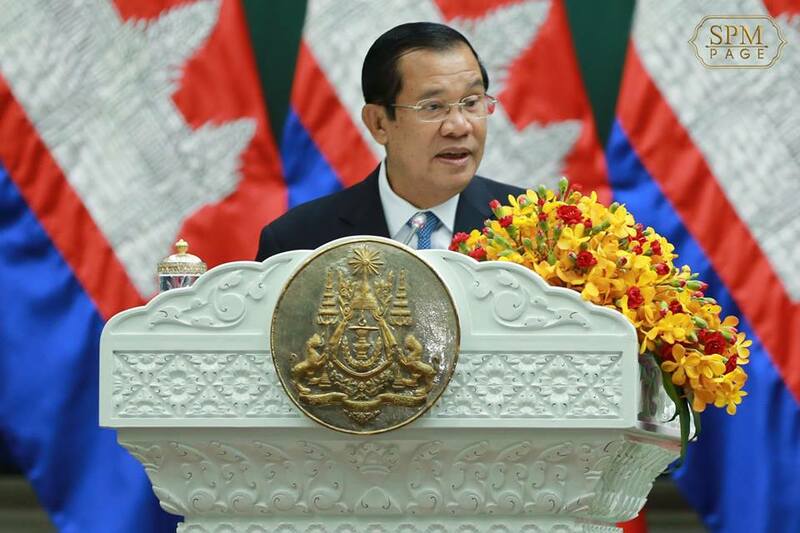 On the rostrum were in attendance personalities like: Prime Minister of Government of Cambodia H.E. 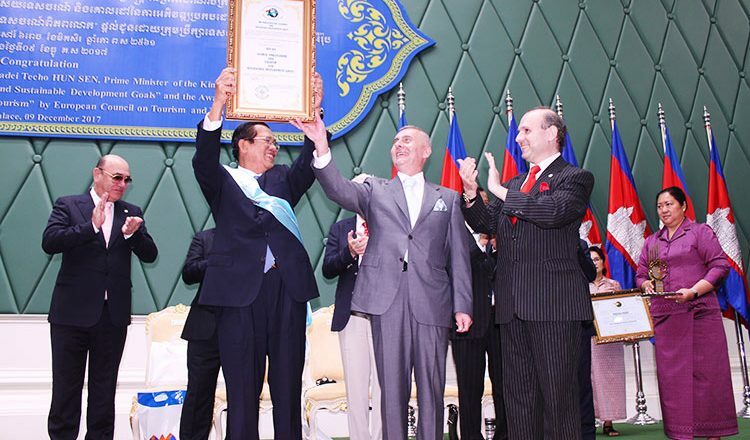 Academician Hun Sen, President of European Council on Tourism and Trade Professor Dr. Anton Caragea, Prime Minister Mark Doda, over 300 diplomats and world leaders etc. First, security is the key determinant of the growth in all sectors. In fact, the awarding of above status to Cambodia takes place after dark period of chronic war, genocide and divide caused by foreign interference, especially the cold war ideology. Sacrifice, loss of life and property, hardship, tragedy beyond description Cambodia must face with so many years in order to achieve peace, national unification and harmony nowadays. Today, in spite of complete peace and national unification under one constitution, one King, and one government, Cambodia is still unable to overcome both tangible and intangible consequence of the past war and tragedy. Therefore, Cambodia must protect peace at any cost because “peace is imperative for the achievement of sustainable development goals 2030”.